Included as part of the release of the draft Unitary Plan is further information about options for where urban expansion might occur in the ‘greenfield areas of investigation’ that were highlighted by the Auckland Plan. 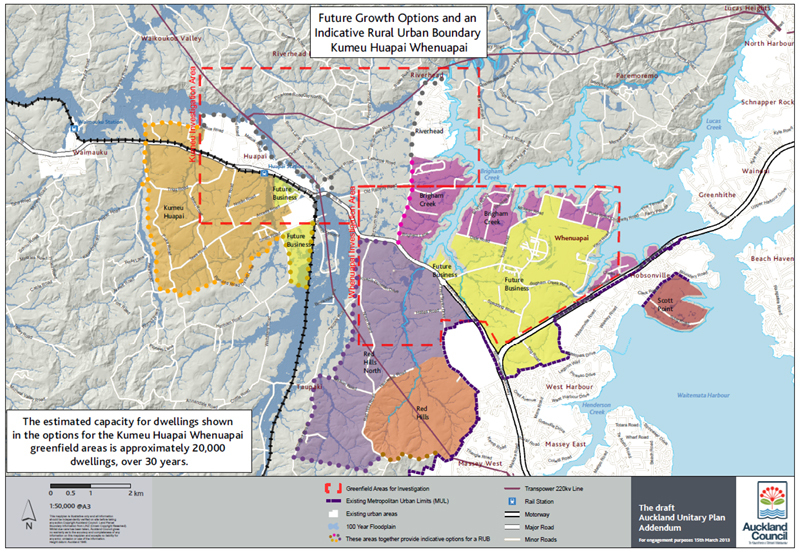 There was some consultation on options in the south at the end of last year, but now it seems that some initial thinking has taken place over where urbanisation might happen in the northwest (Kumeu/Huapai/Whenuapai), Silverdale and Warkworth areas. There’s also some updated information on the south that I will get to in a future post. In fairly recent times we’ve seen the Northwest Busway project advance into future plans (although it seems to be being completely ignored in Te Atatu interchange designs) while the Auckland Plan also talks about a busway connection between Westgate and the North Shore along the SH18 corridor. Finally, while electrification of the Western Line finishes at Swanson, development of the scale proposed here may make it viable in the future for electrification and double-tracking to be extended to the Kumeu/Huapai area, although that doesn’t seem to be in any of the plans at the moment. Can something be done about the flooding issues which seem to have put off development around the railway line in areas like Taupaki? Should more development be concentrated between Kumeu and Westgate (around a busway potentially extended between the two) rather than spreading out to the southwest of Kumeu? Is there really any justification in trying to keep Kumeu/Huapai separate from the rest of Auckland – other than for ‘identity’ reasons? Could development be pushed a bit further south so that it fell within the catchment of Swanson train station? I guess overall while there seems to be a little bit of logic in what the Council have come up with, it just comes across as looking like a pretty strangely-shaped and rather disconnected urban form. Hopefully there’s still plenty of scope for it to change. Oh for an (affordable) high frequency bus service running Helensville-Waimauku-Kumeu>>>city (via a bus lane). Our timetable hasn’t changed for years (except to get worse). If we can’t have PT, I think the route lends itself to slugging (encouraged with an HOV lane); there are a few spots in town that would work well for pick-ups (still need bus as back up though). What I don’t like about the current bus service. It gets stuck on the norwestern between the top end and where the bus lane starts. Even if the norwestern is freeflowing, the bus has to hang around at Westgate to wait out what feels like a worst-case-scenario congestion time delay. Any regular norwestern driver knows that congestion on SH16 fluctuates through the seasons and days of the week. I know people travelling on PT value their time differently, but nobody likes to sit at a bus stop going nowhere. A bus or HOV lane would solve the problem. I plan to have a good look through the unitary plan this weekend and write my submission. Indeed. Quite why the Westgate overbridge, and the new sections of motorway, were not at least designed to take bus lanes is beyond me. A total failure by ARTA, WCC (who were focussed on rail improvements) and NZTA (who should have at least suggested it). Re Kumeu / Huapai, I would leave a greenbelt around them and leave them to intensify into a mini city in it’s own right (kind of using the European model) rather than just letting the lifestyle blocks preventing any kind of higher density which then makes PT inefficient for the area. It needs a bypass and mixed higher density development around the current Kumeu town centre with a combined bus and rail interchange. If you want to get to Henderson or New Lynn (very possible given the current developments) then train makes sense but if you’re going to downtown Auckland, a bus makes more sense. Waimauku could also develop like this. It would be great to be able to catch PT to Muriwai. Agree completely. Not sure also if the waitakere township could also do with some development. It’s in the waitakere foothills though. Waitakere could be a very cool ‘sustainable’ town centre. We looked at buying there a few years ago but didn’t in the end because of the lack of regular PT to Auckland. It’ll be interesting to see if PT to Waitakere gets better or worse post-electrification of the railway to Swanson. Will they maintain to frequency with a diesel train, or lessen the frequency with a diesel train, or replace it with a much slower diesel bus, slogging it up and over the hill at 20km/h? With all the development planned in the above maps, now is the time to extend the rail service to Kumeu, to enable rail-based travel patterns to develop as people move into the area. Or maybe they will increase the frequency with a diesel bus. They could afford to do that if they weren’t running an infrequent diesel train line to service one station. The above growth is decades away. We should wait for the expansion to actually start happening then electrify the line to Waimauku. Prior to that we should build busway elements on the more developed inner sections and wait to extend that too. Otherwise it could be twenty or thirty years of moving air around and wasting scarce funds on an perennially empty train line. Demanding a useless rail service decades before it is needed is a dry good way to see it fail and be written off forever. Do you not remember what happened with Helensville? How much political potential was lost with that poorly timed boondoggle, how much damage done for something that could not have worked at the time? There is a big difference between Waitakere and Helensville in terms of distance and time. I was never in favour of the Helensville service. Maybe, in conjunction with a bit of town planning, a high quality PT service should be introduced to Kumeu to encourage growth in the area? Yes Nick, it will be interesting to see if PT to Waitakere is downgraded from rail to a bus. Have you ever seen a bus going over the hill there? 20km/h, belching smoke all the way and holding up traffic. Unless you plan to operate two buses, there won’t be any greater frequency of service. Just a slower journey and more pot holes in the road. Indeed, will they spend millions to downgrade the rail to a shuttle train with forced transfer, or spend less to upgrade to a more frequent bus service that continues a direct connection to Henderson as well as connecting to the Swanson railhead. Hopefully they are ideologues that insist I spending millions to create worse service in the name of steel wheels over rubber ones. Why not two buses? That would still be a whole order of magnitude cheaper than even the most rudimentary diesel shuttle, and give a far better level of service. And why does it have to be a smokey old sluggardly bus? Why is the only option to spend millions to get a diesel rail shuttle operational to barely maintain a rudimentary service, or to run a single old underpowered bus with zero investment? How are you going to encourage people to live in these towns, and not demand a motorway, unless we invest in top quality PT from the start? It’s a bit like the argument for the tram line from Wynyard to Britomart. We know the development is going to happen so stump up for the quality PT links first. Heck the proposed Mill Rd arterial is in the same category I believe. Build the quality PT link before any extra roading capacity. I don’t care if that quality PT link is a busway, LRT or hoverboard ROW. This growth largely isn’t planned to occur for another decade so it might be a bit premature to extend service to Kumeu/Huapai. It probably needs electrification and double-tracking to actually be useful. Hey, I’m not suggesting it should be done tomorrow but we should at least be planning the town and the network for it. Better than planning a 4 lane arterial. They shouldn’t even think of freeing up this land til the NW busway is complete. Trains would be good for Henderson/ New Lynn trips. But it would be hard for anything other than a bullet train to beat a bus into town that was travelling via a NW bus lane. The area would benefit from a better bus service and priorities on the norwestern motorway right now. As would many areas around Auckland. Howick / Botany for instance. However we seem to be tied into building a motorway or arterial first and then kind of providing some half assed PT, maybe, later. Wrong way around in my view. Sure, build a road, but build the PT links at the same time (and I don’t mean some green paint). Even some green paint would be fine so long as it is 24 hour along the side of the motorway with no lateral intrusion and wide enought to do 100 in. Yes, I agree but we really should be planning and budgeting for it so that it happens in a way that makes the most of the possibilities. To just let it grow as per normal in Auckland would be a waste. Great idea with the “sustainable” town. A real point of difference for the area and could be an illustration for the rest of Auckland. Can anyone shed light on development within the mixed rural zone of the ak plan? Brigham creek now views creation of a vacant site as a discreationary activity where under the old countryside rules this non complying.. seems like growth is already signalled before the south. Add in a newly built pump station at riverhead and whenuapai and it sounds like the structure plan is done. Growth cant be decades away. Completion of the Riverhead and Whenuapai pump stations will mean growth a lot sooner. The northern interceptor running underneath Brigham creek through Hobsonville point and onto Albany, is being planned as we speak. Lets hope structure plans aren’t 10 year obstacles like the present.